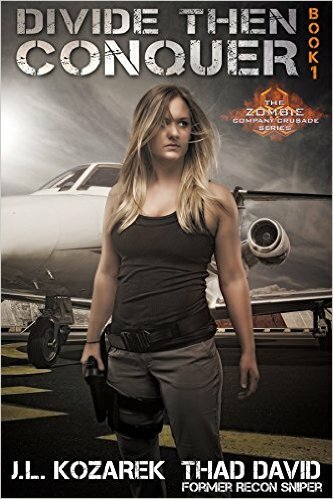 Covert CIA operatives, a tragic enigmatic orphan, peaceniks, military leaders, politicians, and militias face off in a world distorted by waves of human panic and unending zombie invasions. Who will remain when the last war ends? Thank you for your interest in our monthly series. The Three Box Set of Divide Then Conquer is available via download for Kindle, i-Reader and Nook. Follow the links on the “shop” page at http://www.jlkoszarek.com or visit Amazon, Barnes and Noble or Apple iBooks online and search; “Divide Then Conquer, Zombie Company Crusade Series”. This introductory offer includes three parts for free, if you use Apple and for 99 cents if you use Amazon and Nook. Thereafter, each month a new part will become available for download for $2.99. Part 4 will be ready for upload by end of day tomorrow! I am thrilled with it. I hope you enjoy reading them as much as I enjoyed writing them. Let us know how well you like the story by leaving a brief review on Amazon. Again, my collaborator, Thad David, the team at http://www.reconjackmedia.com, and I appreciate your interest and support. On a personal note, Kelly, I wish you a happy new year filled with good health, warmth, and happiness. Thanks for your kind words! You can certainly donate to the cause by uploading our book series, “Divide Then Conquer” by J.L. Koszarek and Thad David. You can find the links here on my site or you can find them at Amazon, Nook, and ibooks. If you read them, let me know how you like them. I love reader feedback and don’t forget about the mobile (ios and android) video game app, Zombie Company Crusade is getting ready for beta testing and slated for release this spring! Download the books and let me know what you think.